Apple has taken another step towards improving the cord-cutter experience with its new Live Tune-In feature, reports AppleInsider. Using Siri, you can tell your Apple TV which live TV channel you want to watch–assuming you subscribe to it. It’s unclear how apps gain support for this feature, but it currently works with at least the CBS, ESPN, and Disney XD apps. That list will undoubtedly expand rapidly in the coming months. The list of apps that Siri for Apple TV can now search continues to grow, with the CBS Now app now supported. If you’re looking for the best place to watch The Big Bang Theory or CSI: Cyber, just ask Siri. The app that lets you subscribe to CBS for $5.99 joins movies and TV shows from iTunes, Disney Channel, Disney Jr, Disney XD, FOXNOW, FXNOW, HBO GO, HBO NOW, Hulu, Nat Geo TV, Netflix, PBS, PBS Kids, SHOWTIME, SHOWTIME Anytime, Starz, and Watch ABC, according to this Apple support article. Just as sports have been one of the major roadblocks for would-be cord cutters getting rid of their cable, annual editions of sports games are a major force for the console gaming industry. Each year, the new NFL, NBA, MLB, and NHL games keep people tied to their consoles, but NBA 2K16 offers a fun alternative for those basketball fans willing to accept some of the limitations. Starz, the premium cable channel known for shows like Outlander and Black Sails, is coming to the Apple TV (and iOS) with a new a la carte subscription service. The Starz Play app offers access to their shows and movies for $9 a month, or for free if you are subscribe via your cable provider. The app also supports universal search via Siri and up to four users simultaneously. Definitely worth exploring if you have any gripes about the Apple TV interface! In disappointing news for Apple TV gamers, Disney has stopped development on Disney Infinity 3.0, a launch title for the Apple TV, Touch Arcade reports. While Apple is still selling the starter pack and some figurines, new figurines have been reported not to work. and Disney has confirmed no further updates will be forthcoming. 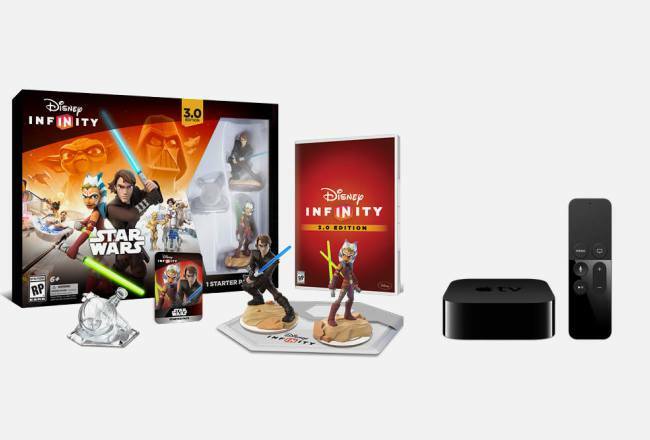 While this might appear to be sad news for the Apple TV, this isn’t the only platform Disney Infinity is leaving. The PC version has also stopped development, a result of minuscule sales in comparison to the console versions. For movie buffs interested in a movie streaming service that isn’t mostly pseudo-documentaries of Dan Aykroyd talking about aliens and pyramids, Lionsgate and Tribeca Enterprises (known for their film festival) has released its Apple TV app for Tribeca Shortlist. Tribeca Shortlist costs $4.99 a month and offers a collection of highly-regarded movies (the top half of the movies on the service have a Rotten Tomatoes score of about 90). In addition to some well-known movies, the service is looking to offer first-run movies from the film festival circuit. Glenn Fleishman at Macworld has a review of a new accessory for the Apple TV that adds new audio output functionality. The Kanex digital audio adapter connects to the Apple TV via HDMI and a television via HDMI, but also includes a 3.5mm port to output stereo audio and a S/PDIF optical digital audio port. While costly at $60 for the device, the review is overall positive noting that it should assuage the concerns of the people unhappy with the new Apple TV’s reduced audio output options. Showing a different tone from most Apple commercials, Apple has released a new TV spot featuring Nikolaj Coster-Waldau (Jaime Lannister from Game of Thrones) and Alison Brie (Annie from Community). The two actors play themselves as they rehearse a kissing scene by referring to a movie on the Apple TV and using Siri to rewind. It’s great to see Apple promoting the Apple TV and trying something new with a comedic commercial.